The Glimmers (Mo and Benoelie), a dj duo hailing from Ghent, Belgium understand something intrinsic to the concept of making music and more importantly, making mix compilations. Music is timeless. While most dj's can string together the latest white labels and unreleased tracks from their label and those of their friends and thrill people with initial discovery, the novelty wears off after a short period of time. What's fresh moves on, what's good will remain in our memories, stereos, and ipods. What they've created on FabricLive 31 is a musical time machine layered with an eclectic mix of timeless tracks that take the listener back to another time and place for music, specifically for electronic dance music. The beauty here is without looking at the tracklist, you would never know it. 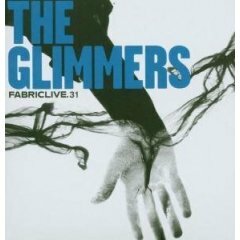 The beats and productions sound just as original and cutting edge as ever and that is a credit to The Glimmers style and their musical knowledge. This mix is not unlike the Choice series where famous DJ's give you a collection of their favorites and mix it together. Where it differs, even betters that series, is in the vitality of the tracks chosen. This sounds like a club mix from start to finish, even though it would be a rare event to hear something like this in a club. I'm not going to list a bunch of standout tracks because every track is an island unto itself. The mix blends 4/4 house beats, disco, punk, rock, reggae, synths, tech, vocals, and synth solos that wash into fuzzy electro and then it all spins back around again. The Holy Ghost 'The Word' (the Dub) and the JD Twitch & Optimo remix of Dance Me In by Sons and Daughters is a really good example of how they blend styles as reggae slips into rock riffs and female vocal snarls. Later, listen to the vocals of Chris The Glove Taylor and David Storrs on the track Reckless for the perfect summation of a "DJ's task" and what the Glimmers boys are trying to do on this FabricLive and then take the time machine back to the future with Pierre Henry to really appreciate it.